Patrick’s love of nature emerged while growing up on the tiny island of Guam where he was surrounded by an abundance of fascinating tropical flora and fauna. One of his most favorite things to do on weekends was create book reports about animals. Patrick also started his own photo-catalog of the local terrestrial and marine animal species. In high school, Patrick got scuba certified, and was completely hooked on studying nature for the rest of his life. After his undergraduate years in Cognitive Neuroscience at the University of Pennsylvania, and two years of a Master’s program in Animal Behavior and Conservation at Hunter College, Patrick honed in on the exact desired career focus — comparative cognition. He basically wanted to combine his undergrad and grad focuses and study just how intelligent animals are, especially with regards to problem solving, tool use, and numerosity. 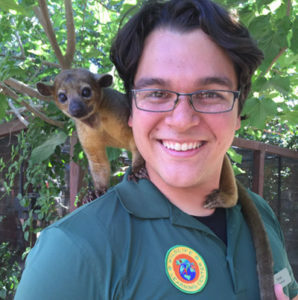 He started volunteering for the Wildlife Learning Center in 2014 to gain more hands-on experience with wildlife, and decided to apply for a wildlife biologist position opening in early 2015. Patrick is ecstatic to have been granted the job and the opportunity to work with so many wonderful people and fascinating animals on a daily basis.